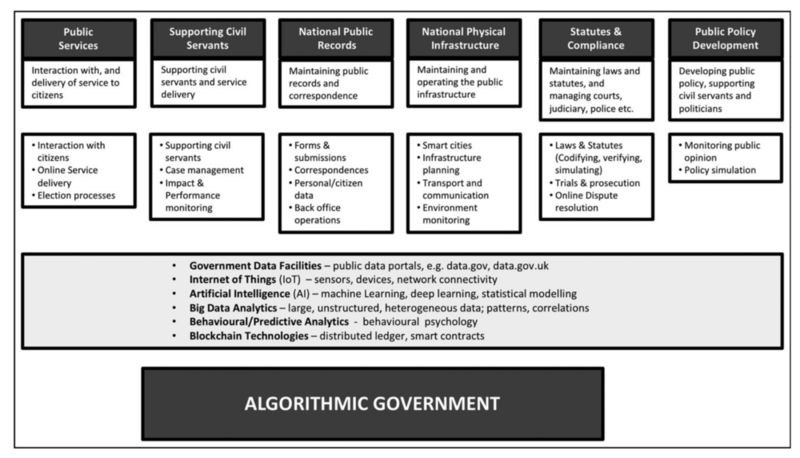 I have just read the interesting paper by Z Engin & P Treleaven, 'Algorithmic Government: Automating Public Services and Supporting Civil Servants in using Data Science Technologies' (2019) 62(3) The Computer Journal 448–460, https://doi.org/10.1093/comjnl/bxy082 (available on open access). The paper offers a very useful, but somehow inaccurate and slightly incomplete, overview of data science automation being deployed by governments world-wide (ie GovTech), including the technologies of artificial intelligence (AI), Internet of Things (IoT), big data, behavioral/predictive analytics, and blockchain. I found their taxonomy of GovTech services particularly thought-provoking. Source: Engin & Treleaven (2019: 449). In the eyes of a lawyer, the use of the word ‘Government’ to describe all these activities is odd, in particular concerning the category ‘Statutes and Compliance’ (at least on the Statutes part). Moving past that conceptual issue—which reminds us once more of the need for more collaboration between computer scientist and social scientists, including lawyers—the taxonomy still seems difficult to square with an analysis of the use of GovTech for public procurement governance and practice. While some of its aspects could be subsumed as tools to ‘Support Civil Servants’ or under ‘National Public Records’, the transactional aspects of public procurement and the interaction with public contractors seem more difficult to place in this taxonomy (even if the category of ‘National Physical Infrastructure’ is considered). Therefore, either additional categories or more granularity is needed in order to have a more complete view of the type of interactions between technology and public sector activity (broadly defined). The paper is also very limited regarding LawTech, as it primarily concentrates on online dispute resolution (ODR) mechanisms, which is only a relatively small aspect of the potential impact of data science automation on the practice of law. In that regard, I would recommend reading the (more complex, but very useful) book by K D Ashley, Artificial Intelligence and Legal Analytics. New Tools for Law Practice in the Digital Age (Cambridge, CUP, 2017). I would thus recommend reading Engin & Treleaven (2019) with an open mind, and using it more as a collection of examples than a closed taxonomy.